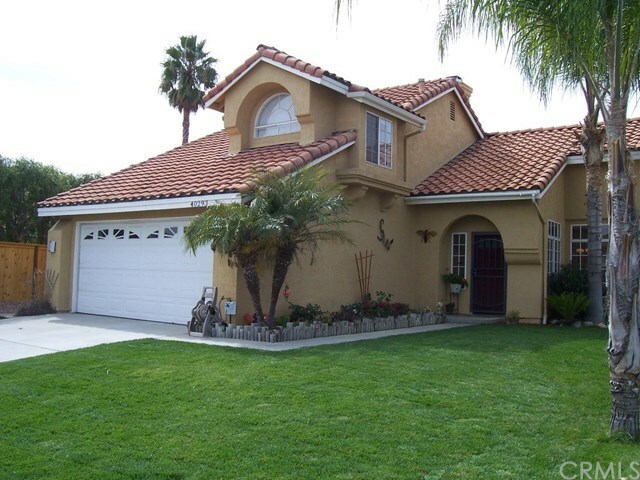 Lovely 3 bed, 2.5 bath home located on a quiet, tree-lined street in one of Temecula's nicest communities--RORIPAUGH HILLS. Home has DOWNSTAIRS MASTER SUITE with PATIO ACCESS. Two bedrooms and full bathroom upstairs, plus alcove/retreat. Living room with FIREPLACE also has PATIO ACCESS. Large backyard is pet and child friendly. Eat-in kitchen. NEIGHBORHOOD PARK, TOT LOT, and SWIMMING POOL are DIRECTLY ACROSS THE STREET. Chaparral High School is just three blocks away. Drive 5 minutes and you are at the Promenade Mall with excellent entertainment, shopping, and many restaurants. Also a short drive to the 15 Freeway. Association Amenities--two swimming pools, tot lots, tennis courts, spa, etc. VERY LOW TAXES AND HOA FEE. CLICK VIRTUAL TOUR FOR MORE PHOTOS.